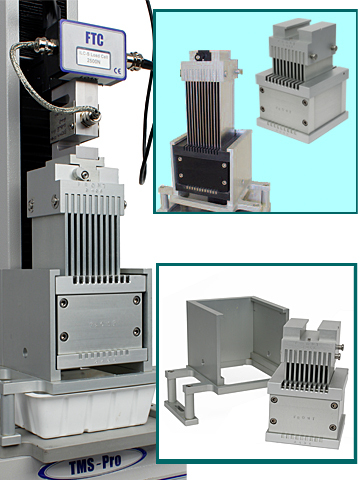 Bulk analysis fixture designs are among the most common and widely used in the food industry. Thousands of these test cells are in use every day in the food industry to measure the texture of a wide variety foods. Large sample size is representative of treatment and handling by the consumer and provides increased reproducibility in highly variable product. The Bulk analysis method is used to measure particulate products where analysis of individual components is not practical or representative. The test ideally combines compression, shear and extrusion forces and correlates very closely to sensory panel “mouth feel”. The most famous bulk analysis accessory is the Kramer Shear Compression Test Cell (KSC). The original design developed by Dr Ahmed Kramer (one of the founders of Food Technology Corporation) employs 10 shear blades that move down through a containment box that holds the sample under test. This fixture is at the heart of the pea tendeness measuring FTC tenderometer.